My 15 Minutes of Fame: Are these the three most important mobile PPC metrics? Are these the three most important mobile PPC metrics? Mobile and desktop paid search ads vary wildly in terms of the use case and the UX. Fewer ads are displayed on the mobile screen and advertisers have less copy to work with. Mobile searchers are also in a different frame of mind. They’re more likely to know what they want and are ready to take action rather than browsing. Research shows that three out of four mobile searches trigger follow-up actions, whether that be further research, a store visit, a phone call, a purchase or word-of-mouth sharing. As a result of these differences, marketers need to monitor different KPIs and metrics. A new report by Bing highlights three PPC metrics that matter most in mobile PPC. Personally I would suggest that this list is a bit basic but then I’m not a mobile PPC expert. I’d be interested to hear other people’s opinions. Let me know in the comments. For more on this topic, read our other post on important considerations for mobile PPC success, or book yourself onto our PPC training course. Click-through rate is an obvious choice as it’s one of the most basic measures of PPC success. However it’s important to be aware of the additional sensitivity to ad position caused by screen size. 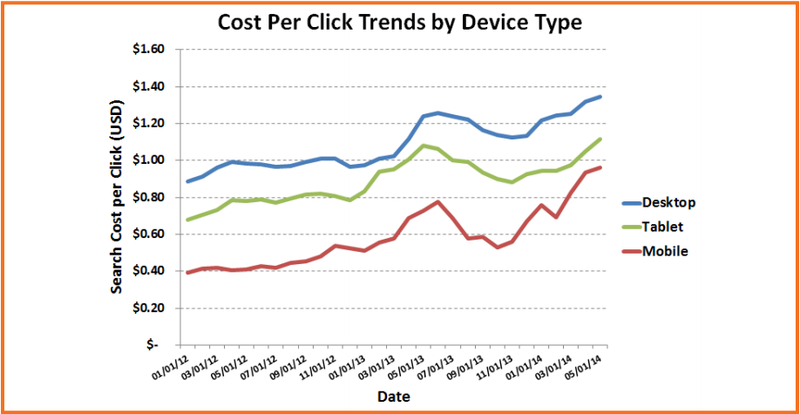 This graph shows the expected CTR based on ad position for desktop, mobile and tablets. The CTR from mobile ads drops off by 45% from position one to two, then drops to almost zero after position four. As such, if brands want to achieve a decent mobile CTR they have to alter their ad strategy (e.g. spend more cash). This refers to the market share of your searches, or how often you will appear in relevant searches. So for example, if you have a 50% impression share then your ads are appearing 50% of the time that people search on the keyword terms you’ve expressed interest in. The smaller screen size on mobile means impression share drops off much faster as your ad position drops when compared to desktop. Mobile ads are much less likely to be shown even for the first position advertiser than they are on desktop, and when you get to position four the impression share is almost zero. The recommendation is therefore to drop ‘informational keywords’ and focus on the key moneymaking terms. The third and final metric is the cost per click (CPC), which typically tends to be much lower than on desktop and tablet. Unfortunately the sale may soon be over, with data taken from Webstream’s clients show that the gap is closing. Mobile CPCs will likely pull even or eventually overtake desktop, so marketers will have to work harder to keep their own CPCs at a lower level.